The primary aim of the Religion, Experience, and Mind (REM) Group is to foster individual and collaborative research projects that seek to understand the interaction of religion, experience, and mind across traditions and cultures. Participants integrate an overall scientific approach drawn from the behavioral sciences (social and cognitive) with historical, linguistic, and ethnographic methods drawn from the humanities. In particular, the Group is using a “building block approach” (Taves 2009) to move between levels of analysis (e.g., psychology and culture). We analyze downward in order to identify underlying cognitive mechanisms that mediate disparate cultural phenomena and then, moving upward, compare how people draw upon and elaborate these processes in light of different cultural goals (Taves in press). Although common in the sciences, this approach is rarely extended upward to include the complex cultural concepts that are central to research in the humanities. We think that this approach has the potential not only to foster integration between levels of analysis, but also to set up more refined comparisons across cultures, traditions, and humanities disciplines, such as religious studies, where a focus on regions and traditions has largely replaced comparative studies. The group meets on alternating Tuesdays when classes are in session (see Calendar). If you are interested in attending meetings, joining the group, or just want to know more, please feel free to contact any of the group members. The REM Lab Group 'Spiritual Perception Project' is a collaborative venture to explore the role of various modes of perception across religious traditions. Using textual material and ethnographic research, the group is looking at different kinds of perception in religious experiences, the relations between specific modes of perception and religious knowledge, and the ways in which these modes of perception are grounded in and/or differentiated from forms of physical perception. The goal of this comparative enterprise is to identify common aspects of perception in varieties of religious experience, as well as how those perceptual experiences are made possible by processes of perception described in the cognitive sciences. The UCSB Crossroads project is an initiative undertaken by the university that provides doctoral students opportunities for interdisciplinary research and collaboration. This research and collaboration is aimed at the development of innovative undergraduate curricula and pedagogical strategies that effectively draw from the humanities, social, and physical sciences. For more information on the university's program click here. As members of the REM Lab Group, the Crossroads Fellows (Vikas Malhotra, Michael Barlev, Nathan Fredrickson, and Jennifer Hahn) are collaborating with faculty in order to develop four original undergraduate courses and accompanying syllabi. For more information on REM's contribution to UCSB Crossroads click here. Graduate students in the REM Lab are encouraged to pursue the graduate emphasis in Cognitive Science offered by UCSB. The emphasis provides a foundation in the various fields of Cognitive Science, as well as opportunities to interact with faculty and researchers in a number of disciplines across the university. The requirements of the emphasis are the completion of three graduate courses, a cognitive science seminar, and a number of research projects and presentations. In addition, two REM faculty (Ann Taves and Tamsin German) are affiliated with the Cognitive Science Program. 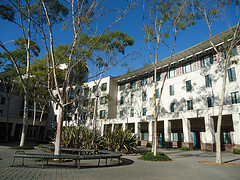 For more information on UCSB's Cognitive Science Emphasis click here.